While the typical kitchen backsplash has been seen in glass, metal and stone, cement tile backsplashes have become very trendy lately. The powerful geometric patterns are a sure way to show off your personality and style in your home. Since each tile is hand crafted, you can customize these tiles. If you do not see a color combination, shape or size you like in stock, the manufacturer can simply create one to fit your needs. I also love that they are environmentally friendly too, comprised of natural components and pigments. 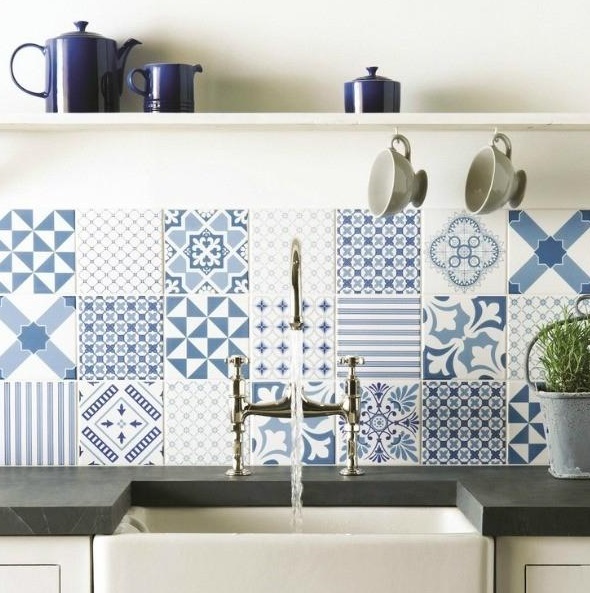 Cement tiles function well as a protective shield over the wall in your kitchen which helps prevent damage from spills and splatters; so much easier to clean and keep clean. 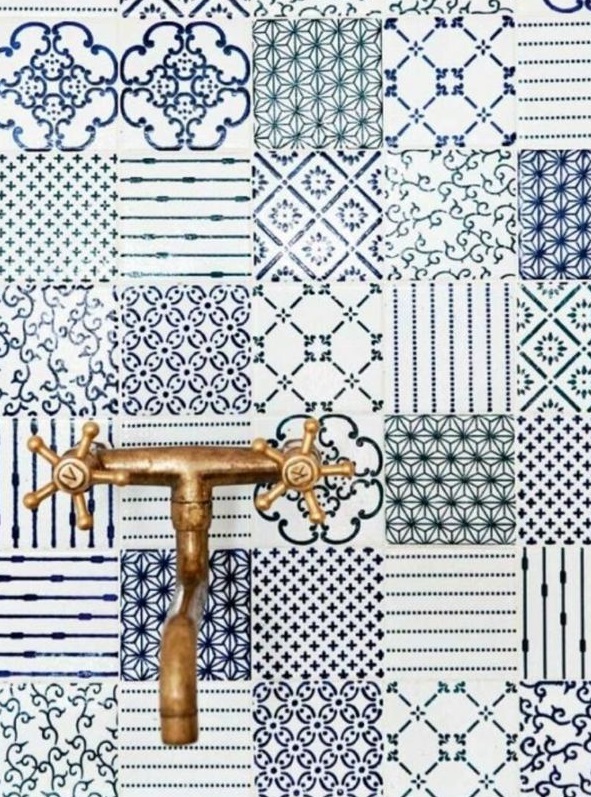 For a bit of history, Cement tiles were first produced in the South of France in the 1870s. They are known under various names such as Mission tiles, Cuban tiles, Victorian tiles, and hydraulic tiles. 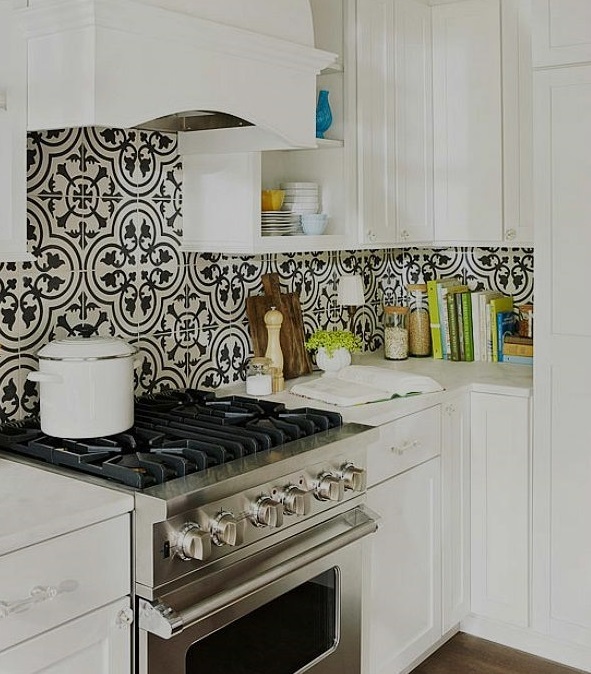 Cement tiles are popular in Mediterranean and Latin style spaces and are generally highly patterned with geometric and floral designs. 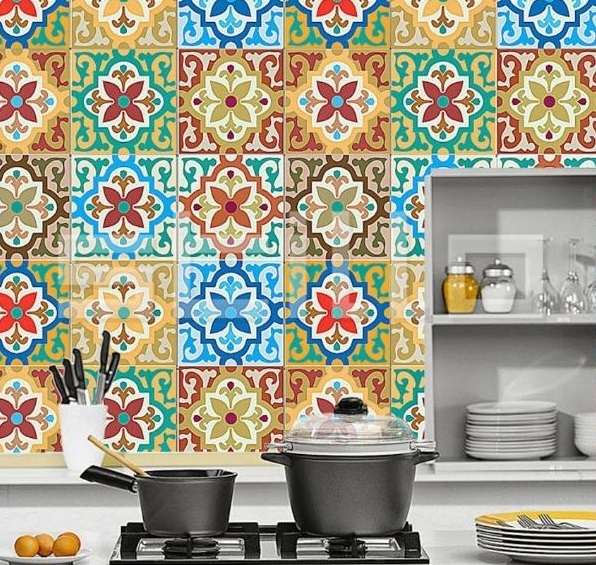 Cement tiles are formed by hand pouring pigmented cement into decorative molds in order to separate the colors. When the cement has been set, the molds are removed and the tile compressed with 2,000 pounds of pressure. 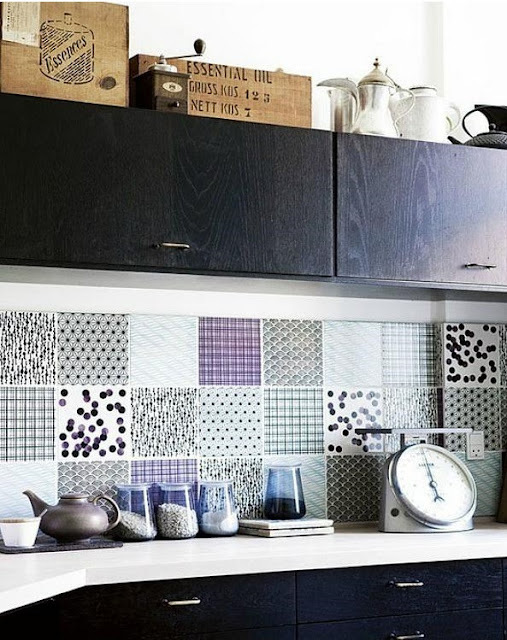 The result is an irresistible work of art to create a beautiful kitchen backsplash. Cement tiles are technically concrete tiles since they include aggregates such as marble dust and a layer of sand for reinforcement. 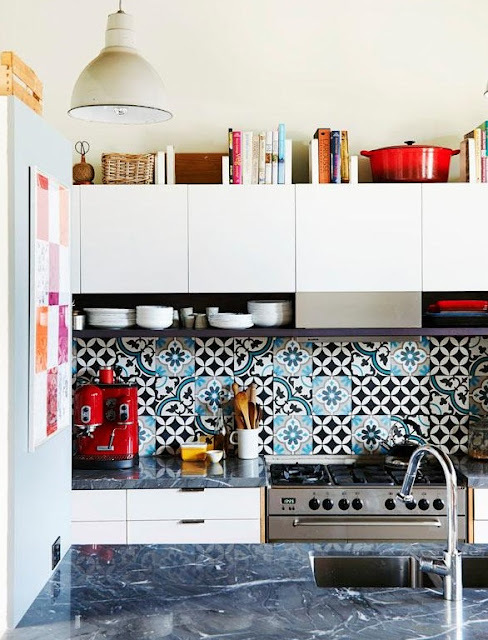 Tip: In order to calculate the amount of tile you will need, measure the square footage of your kitchen backsplash, then be sure to add an additional 10 to 20 percent to that total. This will help to account for any waste you have from trimming or breakage. Adhesive, tile spacers, notched trowel, bucket, tape measure, grout and grout sponge. Tip: Pick a grout color that complements your tile, avoid an exact color match. Select one that will be easy to keep clean and try to stay away from bright white, unless you love scrubbing. Premixed grout that already has a sealer mixed in helps you save a step as opposed to using a topical sealer. 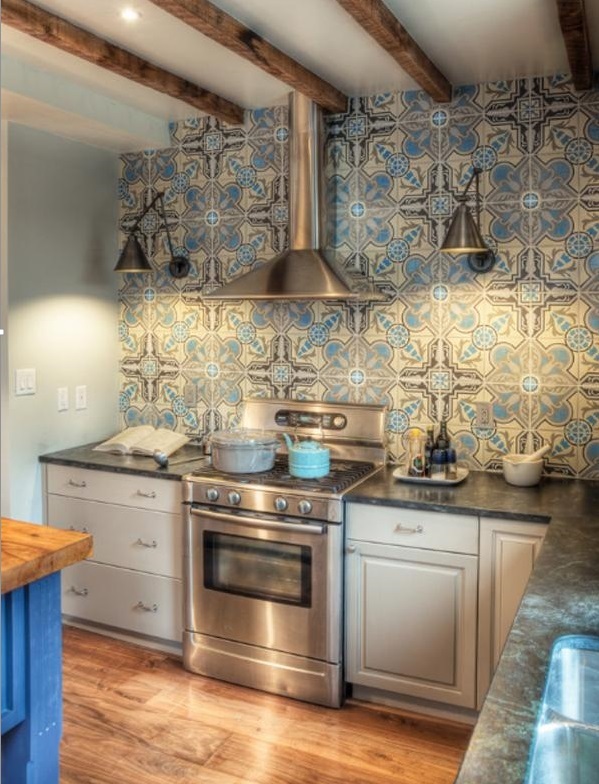 Cement tiles are typically 8 by 8 inches and run about $15 to $29 per square foot. Installation would be the same as ceramic or porcelain tile, with one big difference. Cement tile has to be sealed with two coats of penetrating sealer after is has been set but before grouting. The sealer will protect the front facade of the tile from absorbing the grout material. I think one of my faves are the black and white patterns. This is a modern style kitchen with a display of classical black and white color tones. 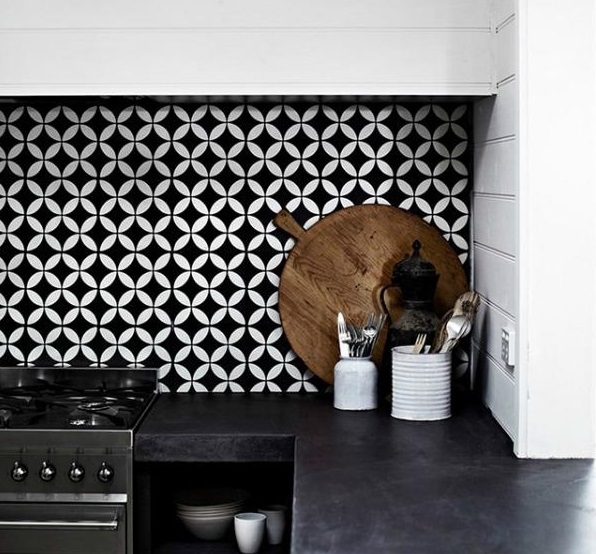 The kitchen features 8"×8" Moroccan cement tile backsplash creating an astonishing wallpaper effect with its daring black and white design.